Hello CERT members and friends, and welcome to the April 2009 edition of our Monthly Update! This Monthly Update is brimming with CERTs announcements, news from the regions, statewide opportunities, new resources available on the CERTs Web site, and ways that you can take action in your home and your community. Explore and enjoy! Exciting Stevens FORWARD! Meeting: Forty six people attended the April 22 Stevens FORWARD! / CERTs / U of M West Central Regional Partnership meeting. Stevens FORWARD! (http://StevensFORWARD.org) has adopted the ambitious goal of becoming the first carbon neutral county in the world by 2015. CERTs presented a $11,000 check to Stevens FORWARD! on April 22nd to support their efforts as part of CERT’s Community Energy Action Fund pilot program. To read more, read an article on the initiative in the Morris Sun Tribune, Stevens FORWARD!—Green mentorship already red-hot idea. 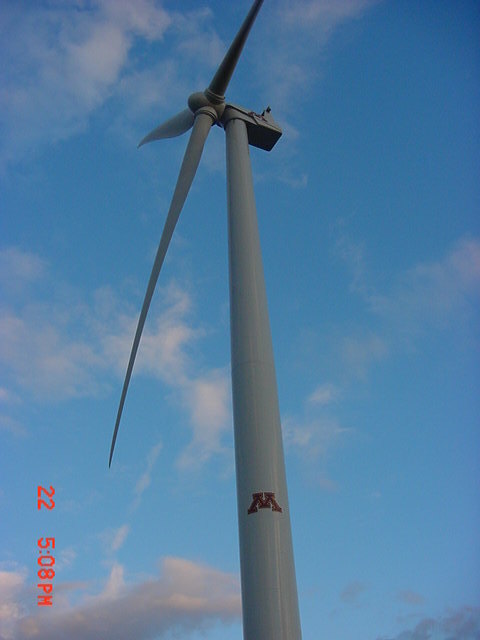 MORRIS, Minn. – University of Minnesota is finding new ways to use wind energy, and it will soon help farmers fertilize their crops. It’s a renewable energy project that’s been in the works since 2005. They just broke ground Monday, June 7, 2010, to start building a system that will use wind power to produce a popular nitrogen-based fertilizer for farmers. “More of a niche for our region is the production of nitrogen-based fertilizer, or anhydrous ammonia, so the process is somewhat elegant,” Michael Reese, director of UofM renewable energy center, explained. The process involves using saved wind energy from the university’s wind turbine, electrolyzing water, which in turn takes nitrogen out of the wind, and producing anhydrous ammonia. Reese said anhydrous ammonia is commonly used throughout the United States, and Morris is no different. This test plant will produce fertilizer to test on the university’s soil. Right now more than half of this type of fertilizer used in the U.S. is imported from overseas. That’s why producing it here in Minnesota will create jobs and bring the industry to rural communities. “It will add economic development to our region and create energy intense industry and so we own the demand for it, for nitrogen fertilizer, here in the Midwest. Now we can also participate in the supply of it,” Reese said. Another selling point is renewable energy. Reese hopes this test plant is just a starting point for a new way to produce nitrogen-based fertilizer. “We might see a time when producing anhydrous ammonia, nitrogen-based fertilizer, from electricity will be the preferred route,” Reese said. Right now most nitrogen-based fertilizer is produced using gas. The plant is expected to be complete and producing the nitrogen-based fertilizer by December 2010. Reese predicts it will take a couple years to test the fertilizer on the university’s farmland to see how it works and collect the data. ” 32 solar panels made in Starbuck will be getting a good work out at the Regional Fitness Center in Morris, and they’ll do it more consistently than most members. Installation is about 80% finished for the grant funded project that is expected to produce about 271 million BTUs a year. Troy Goodnough (good-NO) is the sustainability coordinator at U.M.M. he says Minnesota’s solar resources are as vast as its wind resources. The panels are located on the southwest corner of the building next to the football field. The solar thermal technology is expected to offset about 20% of the cost of heating the recreational pool to 86 degrees daily. They’ll also reduce the RFC’s contribution to carbon dioxide indirect carbon dioxide emissions by 740,225 pounds a year. Goodnough says they received several grants some of which came from the Clean Energy Resource Team and Minnesota Schools Cutting Carbon program. He said U.M.M. also received an anonymous donation for several thousands of dollars. Goodnough estimated when all said and done the project would cost about $200,000. The University is hoping to have the panels producing solar thermal energy by the end of the summer. Thanks Dan..I just posted the “Carbon Neutral” badge for newly planted tree!! Morris is fast becoming a model community for renewable energy research and implementation. Troy Goodnough is the sustainability Coordinator at the University of Minnesota, Morris. He says that leaders from other communities and organizations attend renewable energy tours in the Morris area on a regular basis to see wind projects, solar thermal and solar P.V. projects, biomass and anaerobic digestion systems. Stevens FORWARD! the imitative to determine the destiny of Stevens County has proposed as one of its destiny drivers making Stevens County the first carbon neutral county in the world and that ambitious driver gets a little closer to reality with each renewable foot print. MORRIS, Minn – Senator Al Franken spent Tuesday touring Greater Minnesota after joining the Energy and Natural Resources Committee. Franken said he wants to promote renewable fuels across the state. “Ever since I started campaigning I’ve said renewable energy can really be an engine for jobs and prosperity,” Franken said. Franken listened to faculty and students at the University of Minnesota Morris about possible ideas. A spokesperson for the university said the college is adding wind turbines and has cut down on energy costs. “It’s a great school and great campus,” Franken said. Franken also toured an ethanol plant and talked to farmers at a farmers market to discuss ideas before heading to Willmar to view more energy efficient buildings and businesses. “This region really shows all the possibilities this state really has to create jobs to create energy independence from foreign oil,” Franken said. A spokesperson for Franken added Congress was out of session which allowed Franken to tour the two cities. Written for the web by Brian Collins.